Grantronics: Lawicel CAN Controller Area Network. CAN or Controller Area Network is a robust industrial strength hardware and software protocol used to communicate between microcontrollers. It is very popular in modern automotive applications and is gaining popularity in industrial and home automation applications. This is the CANDIP/AVR, which is the size of a DIP28. 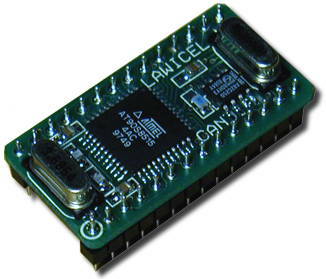 The CANDIP/AVR is equipped with an Atmel AT90S8515 AVR microcontroller and the SJA1000 CAN controller from Philips. This is the Activity Board (ACB1/1) for CANDIP. 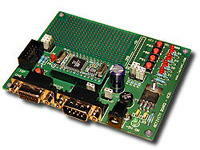 With this board you get a quick start prototyping and testing CAN and your own system. 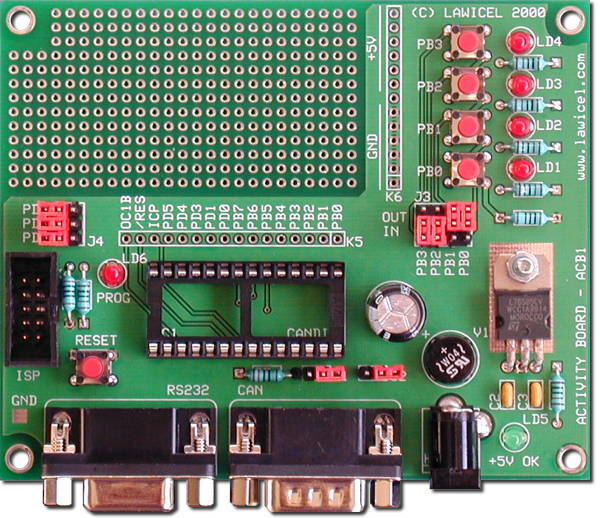 This board is great for educational purposes and a low cost alternative to wire up something on your own. Click on the photo for a larger picture showing all features of the Activity board. 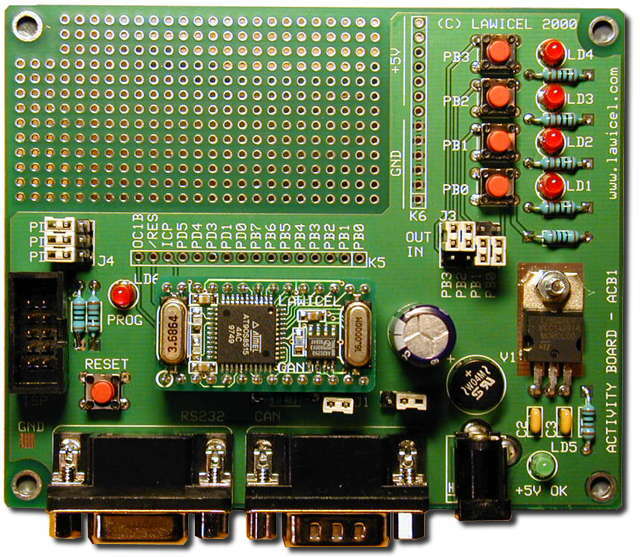 Also available is the ACB1/2 (not shown) is a bare Activity Board that may be partly populated to suit individual requirements. CANDIP/ST1 consist of one CANDIP/AVR, one Activity board (ACB1/1), diskette with sample programs written in ICCAVR, CodeVisionAVR C and BASCOM-AVR. On the diskette, there are also manuals and datasheets. As an option it is possible to include compilers, programmers, AC/DC adapters cables etc. Just ask us what you need and we can offer a bundle price. CANDIP/ST2 consists of two CANDIP/ST1 plus one RS-232 cable, one 1m CAN cable, and more sample programs demonstrating distributed I/O and the Philips PeliCAN mode. The European AC/DC adapter is not included. Australian adaptors are available separately (300mA for 3-4 ST1's). 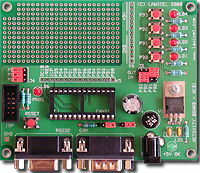 CAN232 is an RS232 to CAN "dongle" to be used with any PC/UNIX/LINUX software or an existing embedded microcontroller that has an RS232 port available. CAN232 is a low cost tool to get CAN connectivity without the need of drivers etc. You simply use your own RS232 driver (in e.g. Visual Basic, Delphi, C++ etc.) and send/receive ASCII commands. WiCAN CANlib is an easy way of getting up running quickly and you do not need a great knowledge of how CAN works. WiCAN currently supports only 11bit identifiers in Philips PeliCAN mode, easy initialization of the CAN controller with standard bitrates and user-defined FIFO queues for receiving and transmitting CAN frames through interrupt control, status information etc. The reason for minimal support is to minimize the resources used in the AVR, so there is plenty of room for the actual application both in RAM and FLASH. It is easy to change the support to extended frames, but since many HLP (Higher Level Protocols) and applications today do not use or support the extended frame we didn't include it as default to save resources. Currently the WiCAN LIB takes less than 2k of the total 8k code space (AT90S8515) together with the demo application (tested in ICCAVR 6.17A/PRO). RAM depends on how many frames you have in the FIFO queues. So you have more than 6k code (FLASH) for your own application! There are 3 versions of the WiCAN CANlib for ICCAVR - CLIB/demo, CLIB/1 and CLIB/2. CLIB/demo is a free version (demo, see below) with fixed 20kbit bus speed and FIFO queues are preset to 4 CAN frames. With this version it is possible to test the CANlib and to see if it fits your needs. CLIB/1 is in Object form (LIB) and can not be changed. Both FIFO queues are preset to 4 CAN frames. This is an inexpensive way of testing the CANlib with full functionality (no speed limits). All you need to do is to include the LIB in the project and add a header file where all CANlib definitions are done. Sample programs are included to show how it works. We can of course change the size of the FIFO queues to suit your needs. CLIB/2 is in fully documented C source code and can be changed to suit your need. Both FIFO queues can be set to suit your needs but only in size of 1,2,4,8,16... to maximum RAM of the AVR. All you need to do is to include the WiCAN.C and WiCAN.H file to your project and you are up and running. Sample prgrams are included to show how it works. The source code is treated as a site licence and you may not distribute or sell the source code further on. Contact us for more information regarding this. For more information about WiCAN CANlib, download the demo and PDF manual. Please add $10 ($11 inc GST) to cover packaging and postage within Australia. Please call for packaging and postage to other countries. All prices are in Australian Dollars. MasterCard, Visa and Australian BankCard accepted. Australian customers should add 10% GST. Export sales are GST free. We reserve the right to change prices (up or down) without prior notice in response to the changing exchange rates. There is a 2% surcharge for credit card sales. Other Lawicel products are available. Please ask for price and availability. Copyright © 2002, Grantronics Pty Ltd. All rights reserved.